Does your child need formula containing DHA and ARA? What are the possible benefits and is it safe? DHA stands for docosahexaenoic acid and ARA stands for arachidonic acid. These are considered long-chain fatty acids, which you may see mentioned by the letters LC-PUFAs. You may also be familiar with DHA as being a form of omega-3-fatty acid. The excitement that prompted adding these compounds to formula and food was the finding that these compounds—previously found only in breast milk—aid in the development of the visual and central nervous system. Behind this excitement lies concern over a babies eventual intellect. We have learned that breastfed babies have a higher IQ, on average than formula-fed babies. Since DHA and ARA have a role in brain development and are present in breast milk, researchers felt that supplementing formula with these compounds may, like breast milk, make a difference in a child's IQ down the line. However, there isn't enough evidence available so far to know whether or not DHA and ARA supplemented formula will have any real impact on brain development in children. Looking at studies done on other animals (animal literature) has also failed to see any improvement in brain development. It is thought, however, that levels of these fatty acids at levels greater than those found in human breast milk may have adverse effects on growth, survival, and neurodevelopment in other animals. We are beginning to learn more about the possible benefits of DHA and ARA in the formula. One is that it appears that the intake of a formula containing DHA and ARA reduces the risk of skin and respiratory allergies in children. The supplements also appear to reduce the risk of asthma and wheezing in children who have mothers with allergies. In addition, babies who receive a formula containing DHA and ARA may have fewer respiratory illnesses. A 2014 study found that infants fed formula containing DHA and ARA had fewer episodes of bronchitis, bronchiolitis, nasal congestion, and diarrhea requiring medical attention than infants fed formula without these supplements. Do your children need supplements of DHA and ARA? 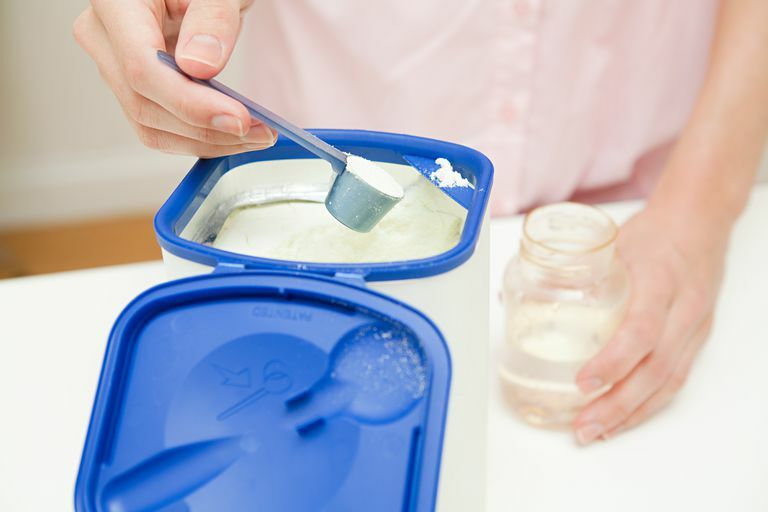 The American Academy of Pediatrics has decided to not take an 'official stand at this time' about whether or not DHA and ARA should be added to infant formula. This is unfortunate since most pediatricians turn to the AAP for guidance on matters like this when deciding what is best for their patients and what they should tell parents. Current studies on humans show no harmful effects of supplementing infant formula with DHA and ARA and some studies even show some benefits to a child's visual function and/or cognitive and behavioral development. However, other studies showed no difference or improvement in development. Since its approval, formulas containing these compounds have been undergoing what is known as "post-marketing surveillance." This recommendation may be frightening to some parents, but it is important to note that most new medications, vaccines, and supplements are monitored in this way. If formula containing DHA and ARA is indeed found to be helpful, its benefits would be most clear in premature infants. Babies that are born early are at risk of DHA deficiency, and it's been found that low levels of DHA in their blood are linked with poorer health outcomes. It was found, in one study, that supplementation could help with these low levels, but it's still too early to know if this makes any difference in the health of these babies. Thankfully, however, no negative effects were found with a number of supplements used. Whether or not to use the new formulas is a difficult decision. Even though there are no reported bad effects to DHA and ARA supplements in human babies, there are a few factors that will turn many parents off, especially that infant formula with DHA and ARA are about 15 percent more expensive than unsupplemented formula. The initial problem that there were no soy, lactose-free, or elemental formulas with DHA and ARA is no longer an issue, as most major baby formula companies have DHA and ARA versions of all of their major formula products. Since preterm babies, if any, probably have the greatest need for DHA and ARA, adding a preterm baby formula containing these compounds is a plus as well. And DHA and ARA formulas are now being supplied through the Special Supplemental Nutrition Program for Women, Infants, and Children (WIC), so that is no longer an issue either. What about DHA and ARA added to baby food? If some DHA and ARA in breastmilk or a supplemented formula are good, is better if you also get it from baby food? Is there a maximum amount of DHA and ARA that you should have? Should you just use a baby food with DHA and ARA if you aren't breastfeeding or giving a DHA/ARA supplemented formula? Unfortunately, there aren't any clear answers to these questions. It is important to keep in mind that none of the foods that are fortified with DHA and ARA state that they are better than breast milk. With all of the effort that these companies are going through to make a product more like breast milk, it should drive home the message about how important breastfeeding is to your baby. In addition to naturally having DHA and ARA, breastfeeding has other advantages and benefits. In fact, a recent study in the Journal of the American Medical Association, the Association Between Duration of Breastfeeding and Adult Intelligence, showed an over 6 point increase in IQ between babies that breastfed for less than a month and those that breastfed for at least 7 to 9 months. That is a significant difference. None of the studies on DHA and ARA supplemented foods showed such a large benefit. Since has been approved by the FDA, doesn't that mean that it is better? Not really. The FDA approval at this time just means that it is thought to be safe to add DHA and ARA to infant formula and baby food. None of the supplemented foods have FDA approval to make any specific health claims about the benefits of DHA and ARA supplementation. There is also concern that has been raised over the FDA regulation of DHA and ARA supplementation of formula, with concern over possible toxic effects. Hopefully, more research will quickly be done to see what real benefits DHA and ARA have. If they can really improve a child's development, then steps should be made to make sure that it is available to all infants who aren't breastfeeding. Although there are many unanswered questions, for babies that aren't breastfeeding, DHA and ARA supplemented foods may be a good alternative to other infant formulas and baby foods. In many ways, it's simply too soon to know what, if any, effect that DHA and ARA supplemented formula will have on brain development in children. It is exciting to see that these compounds may play a role in decreasing allergic and respiratory diseases, but important at the same time to note that the primary reason (and major marketing ploy) behind the addition of these supplements is for visual and central nervous system development—something for which we will have to wait and see. What we don't have to wait for is knowing that breastfeeding can and does make a difference, not only with decreasing the risk of respiratory diseases and allergies but with cognitive (intellect) development as well. In addition, breastfeeding even decreases the risk of sudden infant death syndrome (SIDS). It's important for women to be supported in whatever way possible to maximize the success and ease of breastfeeding for the first year of a baby's life. It's also equally important that women aren't led to believe that these newer formulas are an adequate substitute for breast milk, even if they do, in time, show evidence of helping with brain development. Baack, M., Puumala, S., Messier, S., Pritchett, D., and W. Harris. Daily Enteral DHA Supplementation Alleviates Deficiency in Premature Infants. Lipids. 2016. 51(4):423-33. Davis-Bruno, K., and M. Tassinari. Essential fatty acid supplementation of DHA and ARA and effects on neurodevelopment across animal species: a review of the literature. Birth Defects Research, Part B, Developmental and Reproductive Toxicology. 2011. 92(3):240-50. Foiles, A., Keeling, E., Wick, J., Scalabrin, D., Colombo, J., and S. Carlson. Formula with long-chain polyunsaturated fatty acids reduces the incidence of allergy in early childhood. Pediatric Allergy and Immunology. 2016. 27(2):156-61. Kent, G. Regulating fatty acids in infant formula: a critical assessment of U.S. policies and practices. International Breastfeeding Journal. 2014. 9(1):2. Papillon, A., Pastor, N., Zhuang, W., and D. Scalabrine. Infants fed formula with added long chain polyunsaturated fatty acids have reduced the incidence of respiratory illnesses and diarrhea during the first year of life. BMC Pediatrics. 2014. 14:168. Simmer, K., Patole, S., and S. Rao. Long-chain polyunsaturated fatty acid supplementation in infants born at term. Cochrane Database of Systematic Reviews. 2011. 7L12): CD000367. Sun, H., Como, P., Downey, L., Murphy, D., Ariagno, R., and W. Rodriguez. Infant formula and neurocognitive outcomes: impact of study end-point selection. Journal of Perinatology. 2015. 35(10):867-74. When Are Newborns at Risk for Hepatitis B?